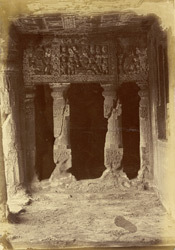 Photograph of the shrine at the left end of the verandah of the Buddhist Vihara, Cave II at Ajanta, taken by Henry Cousens in the 1880s, from the Archaeological Survey of India Collections. The Buddhist cave temples of Ajanta were excavated into a horse-shoe shaped cliff overlooking the Waghora River in the 2nd and 1st centuries BC. Cave 2 is a monastery which belongs to a later phase of excavations, to the late 5th century. At both ends of the verandah there are small shrines. This view shows the facade of the shrine on the left with two pillars of amalaka capitals and shafts of alternating flutes and blocks carved with figures. There are three carved panels above: a seated Naga king with attendants, in the middle and seated Yakshaswhile in the two side panels. A rich floral frieze is carved in between the panels. The cave is particularly remarkable for its painted ceilings.